Growing up, we always watched replays of Michael Jordan’s “The Flu Game” in awe. The greatest player of his generation coming down with the flu, being told by doctors he shouldn’t play, yet heading out on the court with the NBA Finals series tied at 2 and putting on the performance of a lifetime. But was it even the flu Jordan had? 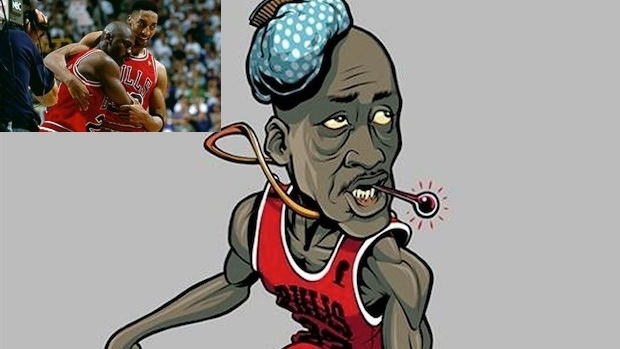 The NBA tells us it was the flu, but a few year’s ago Bill Simmons and Jalen Rose tried to convince us it was a hangover Jordan was nursing. Well, Jordan’s trainer at the time, Tim Grover, wants to set the record straight once and for all, and talked to TrueHoop TV to let them know what really went down. And to the five Utah men who showed up to the door with the pizza they assumingly knew would make the Chicago Bulls players sick… it’s too bad Jordan was the only one who ate it, because the GOAT is probably the only one who could’ve fought threw a sickness and had a Game 5 like Jordan’s. 20 years ago today, Michael Jordan had the 'flu game' during Game 5 of the 1997 NBA Finals. Jordan and the Bulls went on to finish the Utah Jazz in Game 6, winning their fifth NBA championship in seven seasons.